Around a year ago, I spent some time talking to an interesting new startup that, I have to say, I was a little dubious about. The idea of Wasabi was to bring together the knowledge that founders Jeff Flowers and David Friend had in the cloud storage space (they were the founders of both Carbonite and Pilot Software). That knowledge, alongside what they saw as a huge market opportunity, would enable them to put a dent in the storage market share that Amazon Web Services enjoys. …launching cloud storage that is so fast, so cheap and so reliable that it will mark the beginning of cloud storage as a commodity. Oh, my. No pressure, then. What Wasabi was doing is pretty simple. They provide cloud storage that is 100 percent compatible with the Amazon Simple Storage Service (S3) API. 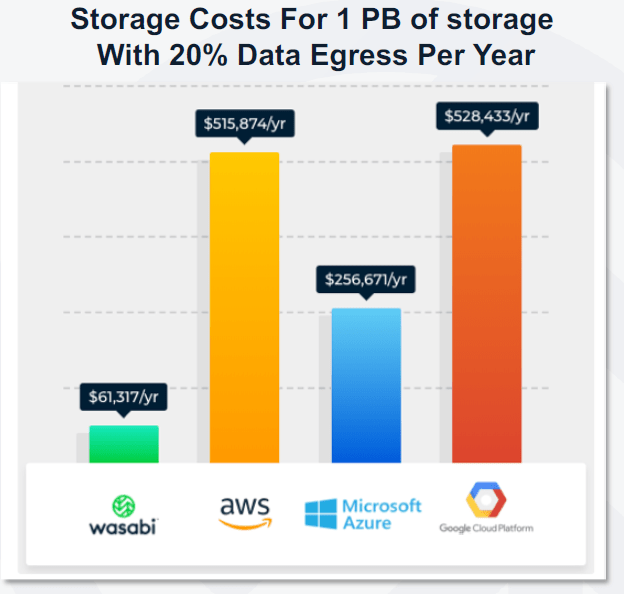 At the time, Friend claimed Wasabi was six times the speed and one-fifth the price of Amazon S3, and even cheaper than Glacier, Amazon Web Services’ cold storage offering. On top of that, it was also touted as being far faster than AWS. …the three big public cloud vendors—Amazon, Microsoft and Google—spend billions of dollars on both capital expenditure and R&D. They have some of the world’s best engineers and developers building their products. That fact alone suggests that while incremental improvements might be made by smart people focusing on a particular problem set or use case, massive improvements in one step are unlikely to be made. So, color me skeptical. I’m pretty sure Andy Jassy, CEO of AWS, isn’t shaking in his shoes at the Wasabi launch. But we’ll have to wait and see what eventuates. I caught up with Wasabi recently, a year on from their May 2017 launch. The company was pleased to report that customers had stored over one billion objects with Wasabi and that the company had hit over 1,500 paying subscribers. On top of that, there are a claimed 4,000+ customers in a trial. Wasabi suggests a mix of enterprise, SMB, and consumers as customers, but doesn’t give any reference customers. Which takes us to today’s announcement from Wasabi who are rolling out what they’re calling the Wasabi Ball Data Transfer Appliance, a shameless reference (albeit a wordier one) to Amazon’s own Snowball Appliance. What the Ball (from either vendor) is about, is allowing large organizations to more rapidly upload data into the respective clouds. It’s a pretty simple concept: grab a ball, plug it into your data center, slurp up all that mass of data you have, ship it to the vendor and – voila – they rapidly ingress it into the cloud. In Wasabi’s case, their Ball is actually the product of a partnership with NETGEAR. Wasabi is using NETGEAR’s RN628X Network Attached Storage (NAS) system as the guts of the ball and, as Wasabi configures it, the ball can transport up to 87 terabytes of data. On top of that, multiple appliances can be used in parallel to transfer petabytes of data into, or out of, Wasabi Hot Cloud Storage. As one would expect for a device that will be out in the public arena, security is key here. 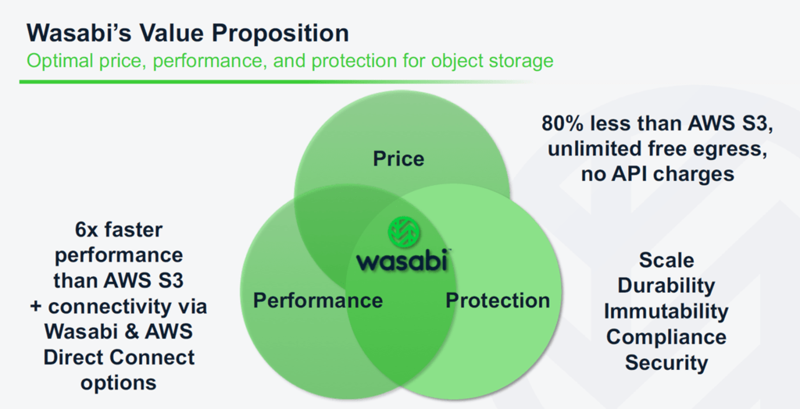 Wasabi ensures customers that their Ball is a highly secure, tamper-resistant appliance that automatically encrypts the stored data using AES 256-bit volume-based encryption, designed to ensure data security and chain-of-custody throughout the transfer process. If you were to ask me a question as to whether a physical device that is designed to make it faster and easier to move data from on-premises data centers to the cloud is a good idea, I’d have to say yes. After all, AWS seems to be seeing some real success with its snowball offering. So, yeah, it makes sense for Wasabi to also offer a ball. But if you were to ask me whether, twelve months on, I have any more of a sense that Andy Jassy is worrying about Wasabi and its threat to his company’s dominance, I’d have to say that I don’t see it. Price is a difficult differentiator to perpetuate, especially when you’re a small startup up against some massive global vendors. Performance is also a little bit temporary – despite claims from pretty much every startup I know to the contrary, no one really has the secret technology sauce that will suddenly render their competitors obsolete. Technological progress is far more incremental than that. Wasabi is hardly the first serious challenger for bulk storage. Likewise, everyone doing it has appliances for massive data transfer. The even come in different sizes – from small box like Wasabi all the way to 20-foot cargo containers full of multi-terabyte disks that can slurp data at a spectacular rate. In this last case, the container may be where the data stays. The container is parked on a pad supplied with “plumbing, power, and ping” and the contents joins “the cloud”. Well, neither David Friend nor Jeff Flowers has said exactly how they get 6 times the performance over S3 storage. They do mention that the performance gains come from writing directly to the disk drives without using a general-purpose file system. Here is an interesting quote from David Friend. “If you’re relying on Linux or Windows or some operating system to control how the bits are physically written to disk, you’re never going to get to our price or our performance,” he said. “This is why it took three years to build this product, after having spent 10 years building a previous version at Carbonite. You have to go in and take control of the heads on the disk drives. And you have to write the data to disks the way you want to write it to disk, not the way Microsoft or Linux wants to write it to disks. Those operating systems were not specifically designed to do the kind of data storage that we do. They were designed for a variety of things that go on inside of a PC. Wasabi recently filed for a U.S. Patent on how they do it, but I could not find anything about it by searching the USPTO. I suspect the USPTO has not placed the Wasabi application in the “patent pending” category yet. So if there is a “secret sauce” in the Wasabi recipe you might eventually find it described in their patent application. That said, a measure of skepticism is healthy considering the claims that Wasabi is making. Well, thinking about what David Friend said about how the Wasabi “application” takes control over how data is written to HDDs, what are they going to do when flash storage becomes the new normal for data storage? Dealing with caged electrons isn’t the same thing as controlling how read/write heads manipulate magnetic domains on HDD platters. Curious about whether the Wasabi “application” will be able to improve writing and reading operations on flash which is already incredibly fast compared to HDDs.